Displaying the crystal structure from the pw.x Input/Output files. 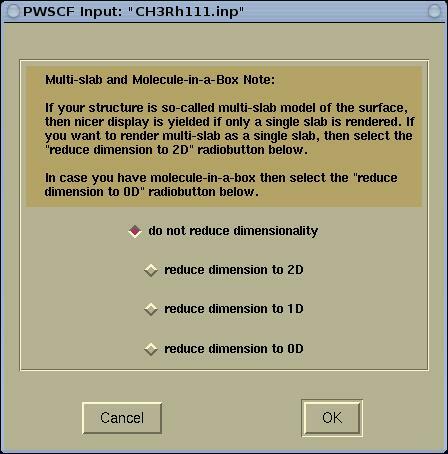 XCrySDen can display the crystal (or molecular) structures from the PWscf input and output files (here the pw.x code is meant). Before visualizing the structure, the program will query for possible reduction of the structure's dimension (here periodic dimensions are meant). For example, molecule has zero periodic dimensions, while surface (slab) has two periodic dimensions, therefore it is recommended to display them with the appropriate number of periodic dimensions. The crystal (or molecular) structure from the pw.x input file can be displayed either by the appropriate command line option or from the menu. Below is the description of the four types of extraction modes. The Display Latest Coordinates mode will display the latest coordinates in the output file. If the latest printed coordinates are the optimized coordinates, then these will be displayed. 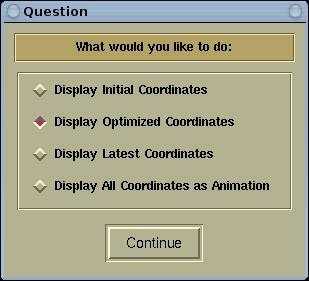 The Display All Coordinates as Animation mode will display the all the coordinates found in the output file, including the initial coordinates. This mode is useful for geometry optimizations and molecular dynamics calculations. The user will have the possibility to animate forth and back through all the "images" of the involving structure during the calculation. Whenever a given crystal structure is displayed by XCrySDen, it is possible to graphically select a k-path for the band structure calculation (spaghetti plot) via the Tools-->k-path Selection menu. Read here the description of how to select graphically the k-path. IMPORTANT: to save the selected k-path in the format compatible with the PWscf, make sure to save the file with the .pwscf extension (example: my_kpath.pwscf).